There are a vast array of unique gifts of Guam and the CNMI on the Internet, including t-shirts, wood carvings, and much more. However, one of the newer and interesting products is Island Name-Art – exclusively available on PacificIslandGuam.Com, dba Gerard Aflague Collection. This is a new fine-art product that depicts the many flora and fauna of the Mariana Islands including the Guam Rail, Micronesian Kingfisher, Marianas Fruitbat, Coconut Trees, and much more, comes in both a traditional Giclee print. With a beautiful motif of the islands with a Chamorro hut, a rainbow, Flying Proa, and much more, designs highlight names in a distinctive styles displaying male, female, and surnames, including the words Hafa Adai – the Mariana Islands greeting, and the words Guam, and the University of Guam, among others. Guam gifts are many, but this new Island-Styled product is a very beautifully designed fine-art print appropriate that is second to none. Displayed in a large 10×24 inch print, this illustration displays beautifully for children’s rooms, foyers, or even island-style gift-giving. 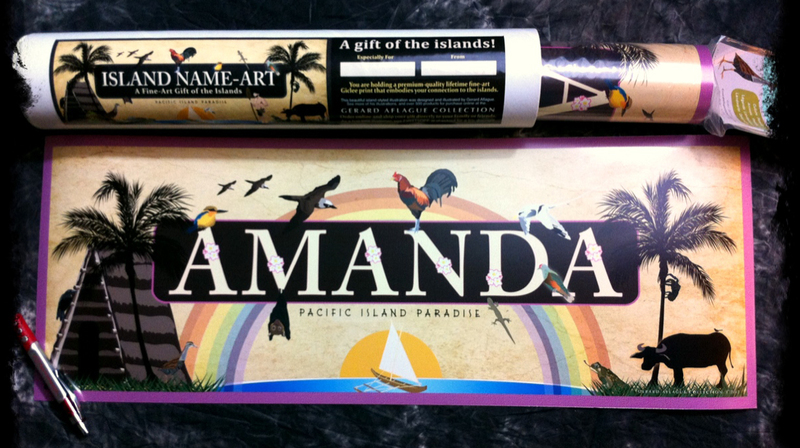 To order one of several designs, or to create your custom Island Name-Art, visit PacificIslandGuam.Com today!